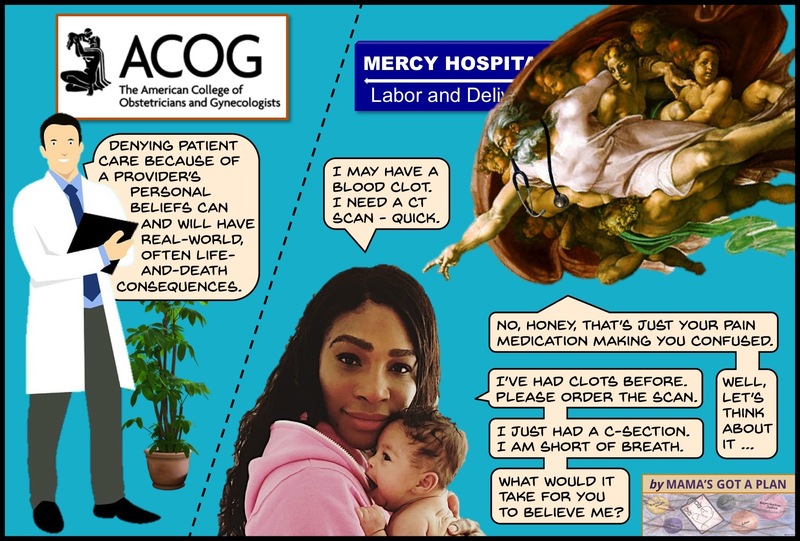 Earlier this month, it emerged that tennis star Serena Williams came close to experiencing life-threatening blood clots after giving birth last fall, in part because medical staff delayed taking action after she requested treatment. Well. All these announcements in such close proximity generated some questions in Ye Olde Cartoon Shoppe. Who is refusing care? To whom? What is their religious justification? Is it religion, or merely culture? What about having children, as opposed to not having them – are there any civil rights in play there? The white-coated doctor is from Pixabay, shared under a Creative Commons license. The photo of Serena Williams and Beautiful Baby Olympia is taken from an online video. Ms. Williams did not to our knowledge speak the exact words attributed to her in this cartoon, but we believe we have correctly represented her intentions. The distinguished fellow with the stethoscope comes from Michelangelo’s The Creation of Adam, where he appeared with more background and without the stethoscope. The work is in the Public Domain. Categories: health care, law, maternity care, reproductive justice | Tags: ACOG, cartoons | Permalink. 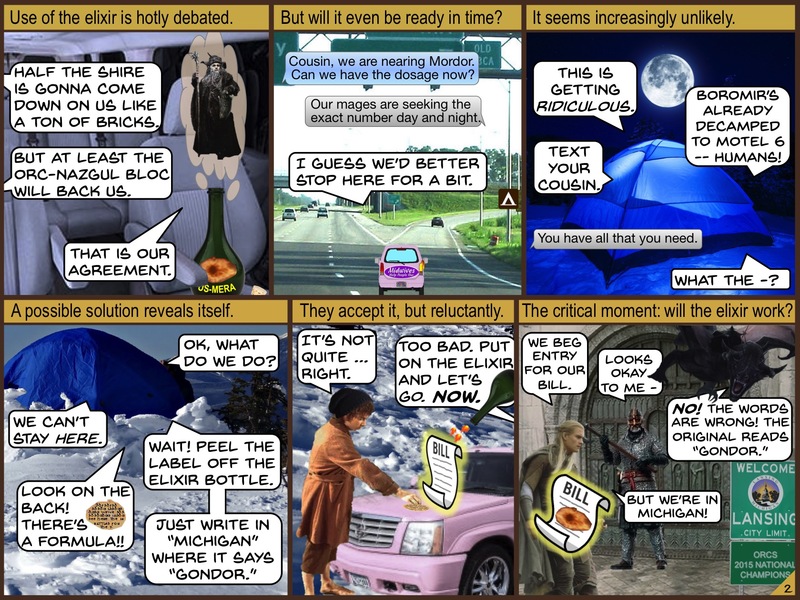 A midquel is a “work that is set within the timeframe of a previous work, rather than before or after it.” The Fellowship of the Bill series featured an increasingly beleaguered and bedraggled band of legislative advocates journeying toward Michigan licensure for Certified Professional Midwives. 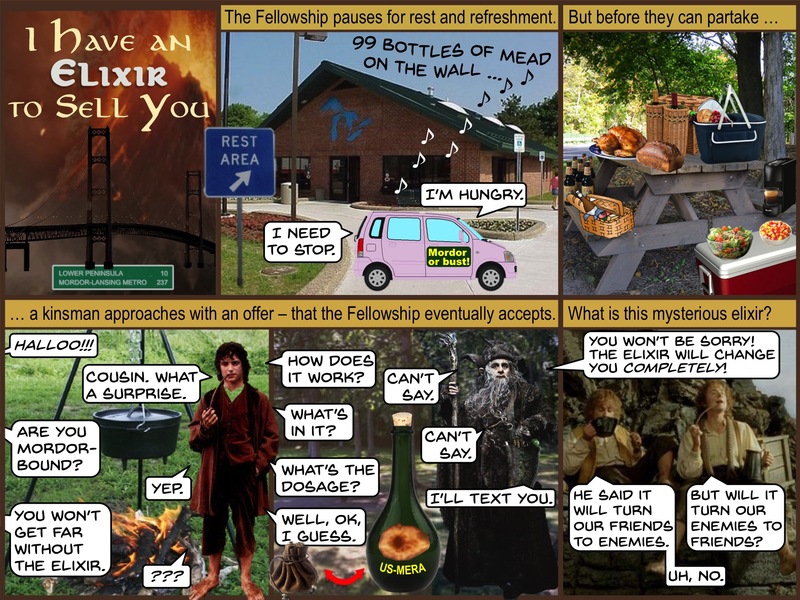 In this midquel, the Fellowship encounters a Mysterious Elixir: newly emerging educational standards for midwives, as produced by a consortium of seven national midwifery groups, known collectively as US-MERA (U.S. Midwifery, Education, Regulation, Association). Three disclaimers are necessary before we proceed. First: Whether certain educational standards should be included in CPM licensure legislation is inside baseball at its most extreme. We promise we will return to topics of more general interest in our next cartoon. Second: Although Michigan’s experience with US-MERA was less than ideal, much of the chaos was a result of interweaving timelines. The education standards were being developed at exactly the same time that Michigan’s bill was proceeding through the legislature. Neither process was exactly predictable, nor did communication flow dependably between parties. Last-minute demands, confusions of meaning, and repeated shifts in focus made measured, documented decision-making quite a challenge. Third: This cartoon arises solely from the fevered imagination of Mama’s Got a Plan. It is not to be taken as a statement of history or policy by anyone who matters. 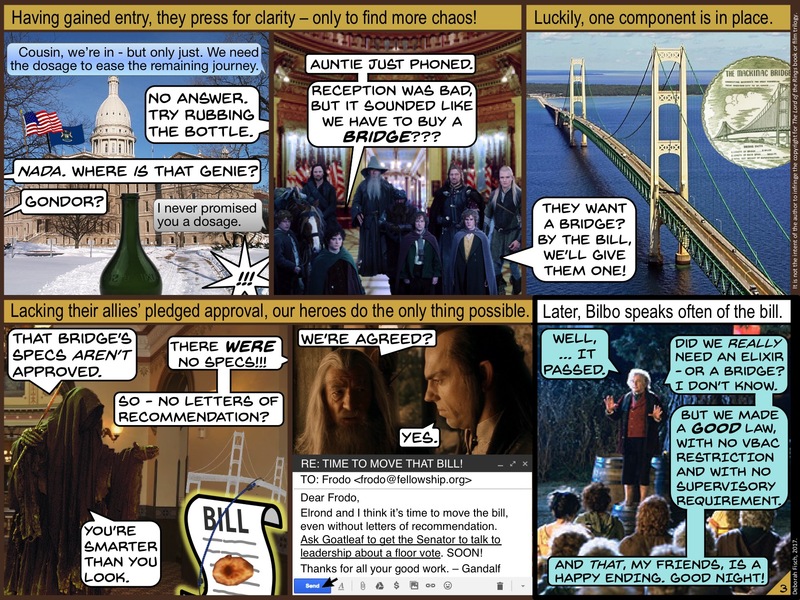 As in our original Fellowship series, many liberties were taken with both Tolkien’s story and Michigan legislative history. No worries – just sit back and enjoy the ride. Click each image to open a larger version in a new window. Categories: law, maternity care | Tags: cartoons, Certified Professional Midwife, education, fellowship of the bill, licensure, us-mera | Permalink. Happy new year! To start out 2018, check out this new feature: Mama’s Bookshelf. Want to find the latest in titles on Reproductive Justice, maternity care, midwifery, community birth, and other topics of interest to Mama’s Got a Plan readers? See the Goodreads feed on the upper right side of this page. NOTE: To read the full review of a book, you must click the book title, not the Goodreads link. You do not need a Goodreads account to view.